Kim will be the celebrity judge of the second annual Stage Fright horror writing competition. 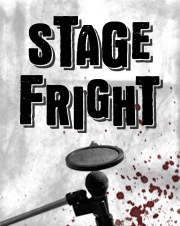 Stage Fright is an annual competition searching for the finest short horror radio dramas from across the world. It’s open to writers of any age and experience level, with three shortlisted entries being performed and recorded live by the Wireless Theatre Company at a special event on 14 October, 2013. Kim will be present at the event, and will choose one of the three entries to receive the André de Lorde Award for horror writing – named for the infamous French playwright of the macabre. Last year’s event saw inaugural judge, Rocky Horror’s Richard O’Brien, present Jeremy Fielding with the award for his M R James satire ‘The Sacred Amethyst of Myanmar’. Stage Fright takes place on the opening night of the third London Horror Festival, an annual celebration of horror in the performing arts that will run from 14 –31 October, 2013 from its home at the Etcetera Theatre, Camden. The London Horror Festival offers a platform for companies and performers to come together to present a range of theatre, performance, comedy, music and interactive experiences in the run-up to Halloween. A recording of the Stage Fright winners will bemade available from the	Wireless Theatre Company website soon after the	event. The deadline for submissions to the competition is 15 August, 2013. Guidelines and information on how to apply can be downloaded here.